Habit: Shrub. Leaf: +- clustered on short-shoots, simple, persistent or drought-deciduous, generally deeply 3--9-lobed, generally with +- sunken glands adaxially, margin generally not toothed, +- strongly rolled under; bases persistent, overlapping, sheathing stem. Inflorescence: flowers generally 1 on short-shoots. Flower: hypanthium +- funnel-shaped, outside hairy, partly glandular or not, bractlets small, lanceolate; sepals 5, overlapping; petals 5, white to cream [yellow]; stamens (15)20--80(125); pistils 1--7(10), simple. Fruit: achene, +- fusiform to oblong, styles persistent, +- hairy. Habit: Plant 2--25(40) dm. Leaf: lobes 3(5), central generally spiny at tip, lateral from generally above middle. Flower: hypanthium +- 2.5--5 mm; sepals 2--4 mm; petals 4--8 mm, +- obovate; pistils 1--2. Fruit: canescent; style 5--7(10) mm, not plumose. Stem: twig hairs generally glandular. Leaf: adaxially sparsely nonglandular-hairy, sessile or sunken glands few to many. Chromosomes: n=9. Citation for this treatment: Brian Vanden Heuvel & Thomas J. Rosatti 2012, Purshia tridentata var. 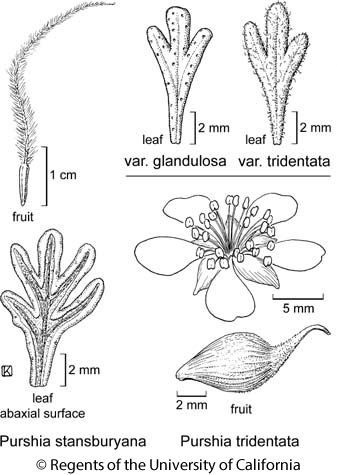 glandulosa, in Jepson Flora Project (eds.) Jepson eFlora, http://ucjeps.berkeley.edu/eflora/eflora_display.php?tid=77220, accessed on April 24, 2019.
c&s SNH (e slope), Teh, n TR, e edge PR, SNE, DMtns; Markers link to CCH specimen records. Yellow markers indicate records that may provide evidence for eFlora range revision or may have georeferencing or identification issues. Purple markers indicate specimens collected from a garden, greenhouse, or other non-wild location.